position Rectangle on the screen to use for the int field. int The value entered by the user. Makes a text field for entering integers. 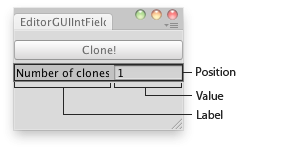 Int Field in an Editor Window. //This script creates a new menu at the top of the Editor named "Examples" with one item "Clone Object".